Heavenly blog! : Nr. 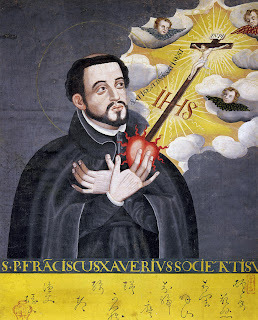 467: Pope Francis 1 has derived its name from the St. Francis Xavier who was Jesuit order's foremost missions! In other words, it's probably a wolf in sheep's clothing! Nr. 467: Pope Francis 1 has derived its name from the St. Francis Xavier who was Jesuit order's foremost missions! In other words, it's probably a wolf in sheep's clothing! Pope Francis 1 has derived its name from the St. Francis Xavier who was Jesuit order's foremost missions! In other words, it's probably a wolf in sheep's clothing! Jesuit Order is what we might call the "police" in the Catholic church that holds it together to manage the under and within. Never misled you to believe that they are working for God, they work basically in from Satan when the Catholic Church is no true Christian church built on the apostles and prophets doctrines. The white smoke from the Sistine Chapel had not lost, until old skeleton began to pipe in the closet on the other side of the Atlantic. When the Vatican to visas issued its first non-European pope in the evening, there were many who thought "finally" - not the least of us who think from the outside. On the other hand, was perhaps the road across from "the new world" extra card for Jorge Mario Bergoglio. He is after all the son of Italian immigrant parents, as Argentina is full of. MILLITÆRDIKTATURET. Many are joyful that the new pope holy Francis as ideal and has distinguished himself as a champion of the poor. Others are concerned and disillusioned with the thought that the former Archbishop of Buenos Aires have our feet firmly planted in the classic conservative theology - like most other candidates pope and Catholic priests in the world. But still there are few in these parts that have begun to ask themselves whether 76-year-old's role under millitærdiktaturet in Argentina. Skeletons in the closet. The white smoke from the Sistine Chapel had not lost before the old skeleton began to pipe in the closet on the other side of the Atlantic: Now the old accusations Bergoglio's role under millitærdiktaturet from 1976-1983 taken up, and time is warranted in order to examine with the microscope. The new Pope has not only been accused of la vera to help priests who were tortured, kidnapped and killed while he was a local Jesuit over head during the "dirty war" in Argentina. In 2005, it raised a case against him by a human rights lawyer, in which five persons testified that the new pope was involved in the disappearances palate of a layman and two priests in 1976. Priests, Orlando Yorio and Franz Jalics, was found five months later, neddoppa and half-naked after being abducted by the Navy. The one of them, Yorio, owe Bergoglio in practice to have given them to death squads, since he refused to recognize their efforts towards the regime. The second, Jalics, has moved to a closed German monastery and would not talk about it. ARGENTINAS AUSCHWITZ. The Argentine digging journalist and writer Horacio Verbitsky wrote the book El Silencio: the Paulo VI a Bergoglio: las Relacion Secrete de la Iglesia con la ESMA about the case in 2005 - Still: from Pope Paul VI to Bergoglio: The secret relations between church and ESMA. ESMA has also been called "Argentina's Auschwitz" and was the most notorious of the Navy's many secret center for torture and execution. Only the title of the book is enough to give the Vatican's communications department enough to make them commanding weeks. BARNERØVING. But there is more. Previously, "las Abuelas de Plaza de Mayo", grandmothers from maiplassen, gone to court in Argentina and accused him for being involved in the abduction of infants under dikaturet. Alicia de la Cuadra, one of the founding grandmother organization, blame him for having participated in the kidnapping of her granddaughter. Since 1976, mothers and grandmothers marched on Maiplassen in Buenos Aires, after the babies were stolen (and later oppdregne) of the same as killing their parents. Today makes some of them with the walker, to reach with the need to find their grandchildren. (Story ending). Here some words of Pope Francis 1: The Argentine human rights activist Myriam Bregman also accuses the new Pope to have allowed two of his own Jesuit priests, the leftist Orlando Yorio and Francisco Jalics, was captured and tortured by the military in 1976. - The junta could not have acted in this way without the support of some key players, says Bregman according to the Daily Mail. In the book "El Silencio" ("Silence") writes journalist Horacio Verbitsky that Bergoglio removed the order protection of the two priests who worked in the slums, which in practice was seen as a green light for the junta to kidnap them, writes Guardian . It is Jalics itself that is the source of the information. Bergoglio has always denied the allegations. Bergoglio was head of the Jesuits in the 1970s, when the dirty war started. Argentine bishops, led by Bergoglio, went out in 2000 and regretted that they had failed to protect the faithful good enough, writes Guardian. But Bergogolio shall not be required to testify in open court about what happened before in 2010, when he was accused of having answered evasively. Final Comment: The thing that disturbs me more than anything else is that here we as Christian believers. Protestants go in tandem with the Catholic Church. There is a gap - an ocean - a throat between evangelical faith and the Catholic Church. It can be impossible to unite if there are things with the Catholic church, which is positive. Among other that they do not accept remarriage as God's word speaks clearly against in the New Testament and the Lord Jesus Christ and the Apostle Paul were here the foremost spokespersons for this doctrine. It really accepted Jesus commandment for believers to marry again! Let Catholics live their lives, but do not mix in with them. They are a harlot church worse than both Jehovah's Witnesses, Mormons and others so that I have said. But it also found and are faithful people there as there are in other sects, I think. But anyway, let's not deal with the church to do as it is and remains a great harlot church in spite of all that which also is positive, and that there are many fine and great people there too, thankfully!